A true adventurer follows their own path, and in doing so they manage to leave the masses and discover the natural and serene scenes not often seen. My visit to Mount Desert Island in Maine was intentionally designed to avoid the tourist traps and crowds and enjoy the island as a local. That’s not to be said that I didn’t visit town and do some shopping, as we all should do that. But the best experiences are those off of the beaten path. One way to get away from the people is to get on a boat and see the island from the water. It was a beautiful morning with blue skies and fluffy clouds. 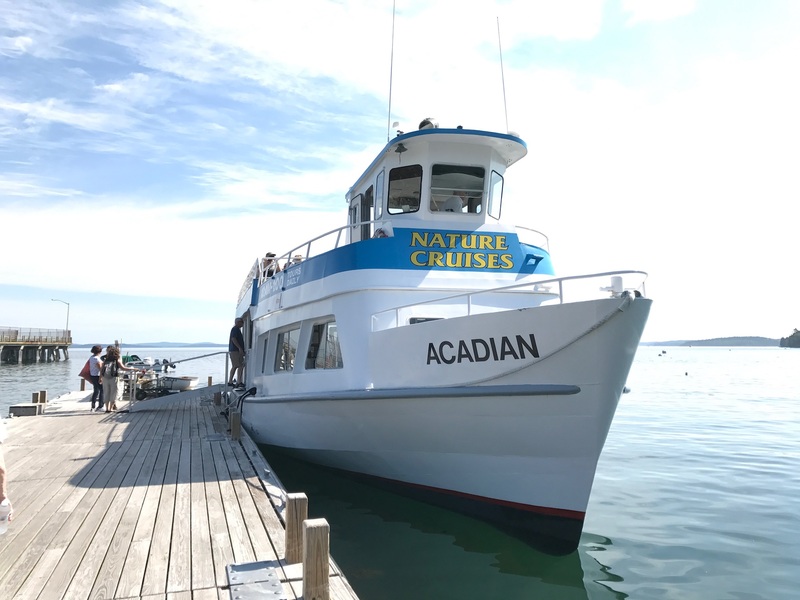 I didn’t have any plans for the day, so on a whim decided to look up a Scenic Nature Cruise from Bar Harbor with Acadian Nature Cruises. Rushing to their dock on the outskirts of town, we departed on the 10:00 a.m. cruise along Acadia National Park’s waterfront. My initial thought was that this would be more of a birding/nature photography opportunity, and I packed lighter with my Olympus OMD EM1 Mark II Micro four-thirds camera with the 300mm f/4 prime lens. At a last thought, I threw in the 12mm – 100mm landscape lens. Thankfully I did as the birds and wildlife were few and far. But the scenic views were truly breathtaking. Cruising past Bar Harbor and Frenchman’s Bay the nature guide narrated for nearly an hour providing historical and points of interest information along the way. I’ve also learned that in calm waters, a smaller boat is better for photography as you can get closer to the water for a better perspective. While many people went on top of the boat to sit in the sun and enjoy the view, I stayed below on the open lower deck to get the best view. We cruised past the towering mountains of Cadillac, Dorr, Sargeant, and the Beehive to mention a few. We also had great perspectives of the Sand Beach and Thunder Hole covered with little people. Along with visiting the shoreline of Acadia National Park, the cruise also passes Egg Rock Light House and the Harbor Seals that come to rest on the rocks near the island. Here are many gulls, guillemots and Common eiders but in the morning cruise, you’re photographing into the light and the pictures aren’t the greatest. So the morning cruise is best for scenic landscape images, the afternoon cruise is best for the wildlife images. The 600mm equivalent reach of my Olympus kit was really helpful for photographing this scene. What is even more amazing is that there are several resident Bald Eagles, and the eagles are used to the cruise boats coming by. With an eagle call, and a small fish thrown into the water, the eagle swoops down not 20 feet from the boat to grab the fish snack and quickly returns to the cliffs to enjoy his meal. Alas, here my wonderful 600mm reach was just way too close and it happened so fast that I didn’t get a chance to switch lenses. If you are really interested in seeing as much wildlife as possible, the best cruise to take is a Bar Harbor Whale and Puffin Watching cruise from downtown Bar Harbor. It was a wonderful way to spend a beautiful morning and I was able to enjoy Acadia National Park from a different perspective that made one realize how small we truly are in the landscape. Love the last video! Is that a house? Nice building ! Always a joy to stop by!! Hugs from Vancouver!